Image of surface reconstruction on a clean Gold (Au(100)) surface, as visualized using scanning tunneling microscopy. The individual atoms composing the material are visible. Surface reconstruction causes the surface atoms to deviate from the bulk crystal structure, and arrange in columns several atoms wide with regularly-spaced pits between them. 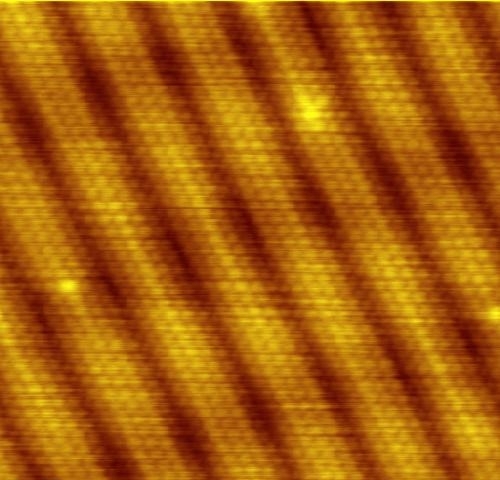 Atomically resolved STM image of clean Au(100). This image is made with an Omicron Low Temperature STM and RHK Technology electronics by Erwin Rossen, Eindhoven University of Technology, 2006. Parameters: p<1e-11 mbar, T=77 K, I_setpoint=6 nA, V_bias=1 mV, Au(100) surface is Ar sputtered (1,5 kV, 2uA, 30 minutes) and annealed (500°C, 30 minutes). Dieses Werk wurde von seinem Urheber Erwinrossen als gemeinfrei veröffentlicht. Dies gilt weltweit. Erwinrossen gewährt jedem das bedingungslose Recht, dieses Werk für jedweden Zweck zu nutzen, es sei denn Bedingungen sind gesetzlich erforderlich.